The Debug mode of your Pimcore website will enable you to receive detailed information on any errors in order for you to be able to Debug those and trace their source. Pimcore does not only provide you with such mode but it is flexible enough to fit all your Debugging needs. Let’s begin with accessing the Debug Settings. In order to access the Debug section of settings you will need to navigate to Settings>System>Debug. You will notice quite a lot of settings in that section and for this purpose we will explain each of these settings so you can be fully aware of their usage. DEBUG – The setting is quite self-explanatory. This is the main configuration setting which will enable or disable the Debug mode. Only for IP (optional) – Here you can specify a list of IP addresses which will have access to the debug mode. Password Protection (HTTP-Auth) – Here you will be able to specify the username and the password if you would like to password protect your website. Keep in mind that this will also password protect all the websites you have in the folder where Pimcore is installed. 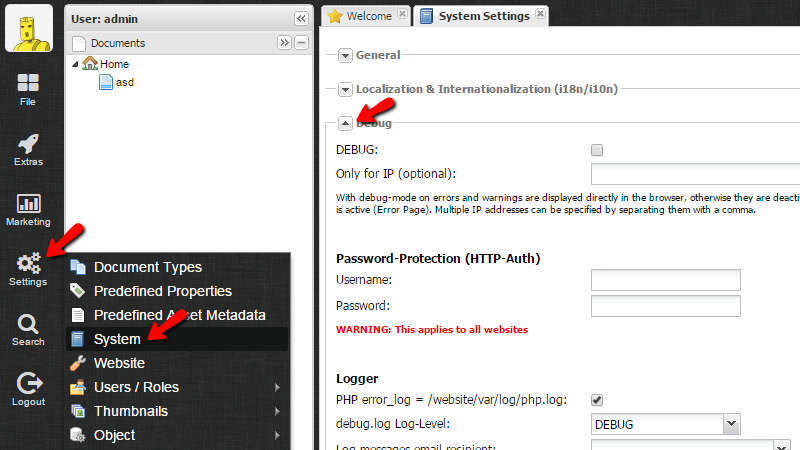 Logger – This set of settings contain information and configuration for the main log which will be used for logging errors and Warnings. 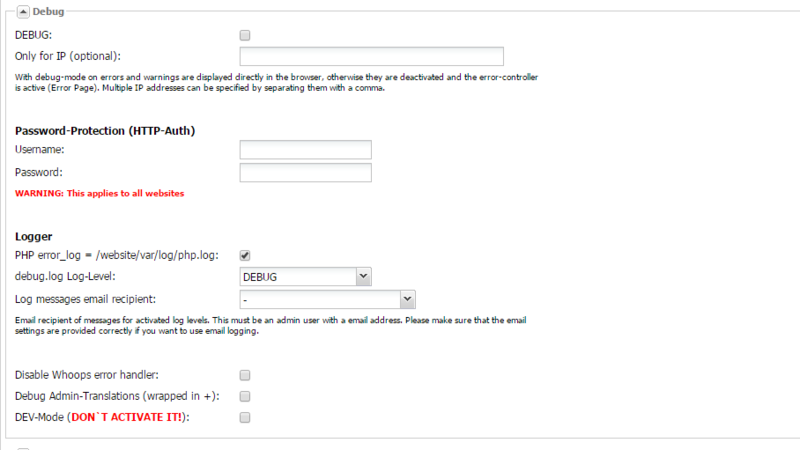 PHP error_log – The location of the error log specified in that setting. If you are agreed with that location simple leave the checkbox checked. Log messages email recipient – If the logs should be sent to some recipient. The last three options are not a mandatory and you should use them in case of you would like to achieve some concrete Debug functionality provided by them. When you are ready with all these configurations please use the Save button in order for these settings to be saved. Congratulations! You can now configure the Debug mode of your application based on your needs and personal likes!